In the study of human diseases and potential treatments, small animal models play a crucial role in bridging the gap between in vitro and in vivo studies. When considering imaging techniques for small animal studies, Positron Emission Tomography (PET) is well suited to the measurement of highly specific molecular interactions (e.g., glucose uptake, target-receptor binding, etc.). Small animal PET tomography scanners constructed specifically for imaging living subject rodents for pre-clinical research and the clinical diagnostic and to enable new drug discovery in academic and pharmaceutical research. IntelLiDrives large center aperture Planar ServoRing Series rotary tables enable researchers in academia, pharmaceutical companies and contract research organizations to develop medical devices and tec hniques to support such research with fully conscious and mobile rodents without the confounding effects of anesthesia. Most current research and commercial small animal SPECT (single photon emission computed tomography) scanners utilize pinhole collimation with magnification in order to achieve sub-millimeter spatial resolution. Many designs have multiple detectors and multiple pinholes per detector to improve system sensitivity and overall image quality. Some commercial hybrid scanners integrate SPECT detectors with high resolution x-ray computed tomography (CT) detectors to generate multi-modality images with co-registered molecular (SPECT) and anatomic (CT) information. These current designs have limitations caused by non-ideal vertical orientation for animal imaging and may potentially interfere with the animal's physiology and the distribution of the SPECT radiopharmaceutical. To solve these problems the latest generation scanner architecture uses IntelLiDrives large aperture rotary tables to independently rotate gamma cameras and detached pinholes collimators. 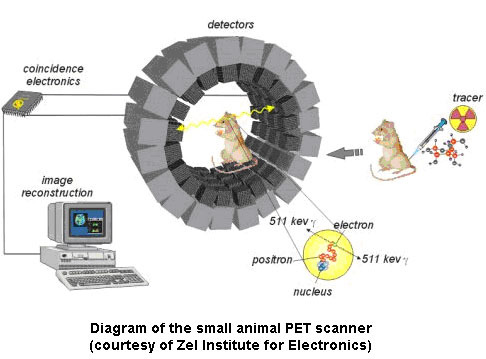 In these scanners the animal is imaged in a horizontal orientation and rotary table large center aperture allows un-restrained animal moves in the axial direction through the aperture relative to rotating gamma camera detectors and collimator. 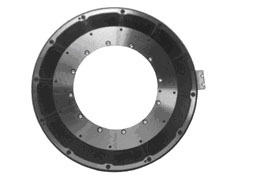 Center aperture of IntelLIDrives rotary tables also allows large trans-axial field of view in the scanning instrument and the ability to obtain sub-millimeter imaging resolution. 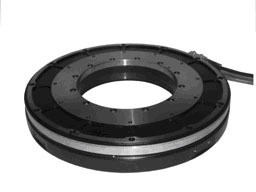 Low profile rotary servo tables Planar ServoRing models PSR300 and PSR300MHS with respective center apertures 115 mm and 145 mm are used in these scanners. They have zero back-lash and are significantly faster than worm gear rotary actuators and have no gear wear or gear vibration and noise. System accuracy and repeatability of these rotary stages maintained over time and allow researchers to obtain sub-mm resolution images with high rate of image acquisition and reconstruction. Direct-Drive motor design has all of the advantages of a brushless motor – no brushes to wear, no gear trains to maintain and high acceleration and high speeds. Precision encoder built into rotary tables allows synchronization with linear transport animal bed to provide helical or ordered-subsets axial sampling.